Welcome to Ward 5 Online: Harvest Fest is Coming! 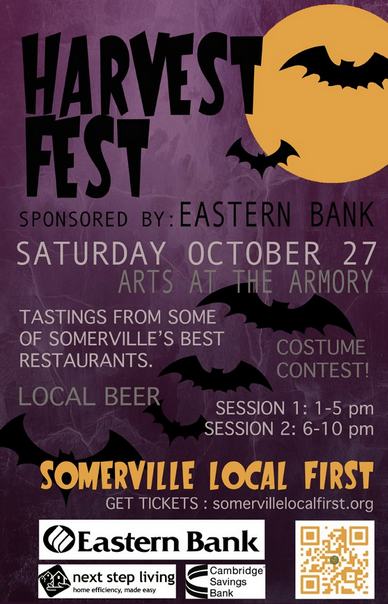 The wait is almost over, one of Somervile's best annual events is THIS SATURDAY! Join them for some great local beer, restaurants, entertainers and community members. Also note that this is their major annual fundraiser and your joyful attendance helps them to do their work throughout the year. YAY! Support SLF and build a STRONG local economy! SLF WILL be reserving walk up tickets this year, so even if you don't decide until Saturday, they hope to see you there. Or just get your ticket now! Wanna learn more? Check out the SLF Blog for some great perspectives, previews and writeups of the event. Here's a preview piece from DigBoston, one from me and a recap from the Patch for last years event.